"Everyone loves this dip, and I'm always being asked for the recipe. 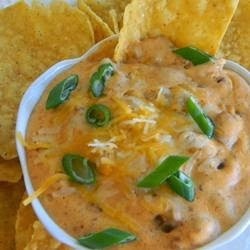 It's a simple blend of chile with beans and cheeses"
In a medium saucepan over medium low heat, mix together chili with beans, cream cheese, cream cheese with chives and Cheddar cheese. Stirring often, heat until melted and well blended, about 20 minutes.